Traditional competition-based strategies aren't enough to sustain high performance. Companies must tap into the blue ocean of opportunities that will take them beyond competition. That's what this talk is all about: how to shift perspective, challenge boundaries and inspire people’s confidence so your organization will shift from competing to creating, from cutthroat markets to wide open ones, from red oceans to clear blue ones. In this talk, Renee Mauborgne lays out a systematic five-step process anyone can use to make the shift. She shares real-life cases of how leaders in diverse industries and sectors moved from red to blue oceans using this process and how you can do it too. You’ll learn what works, what doesn’t, and how to avoid pitfalls along the way so you can succeed on your own blue ocean journey. If you're ready to seize new growth, inspire confidence and build a compelling future for your company, you need to hear Renée talk about making a Blue Ocean Shift. Disrupt this, disrupt that. Disrupt or die. That has been a popular mantra. But is disruption the only way to create new markets? And is it the best way? Renee Mauborgne says, no. In this talk she talks about why a focus on disruption is limiting and leaves half the opportunities to create new markets and new growth off the table. That other half is what she and her co-author Chan Kim call nondisruptive creation, whereby new markets are created without disrupting an existing one. Mauborgne shares real-life cases of how leaders in diverse industries and sectors created growth through nondisruptive creation by making a shift from red to blue oceans using the systematic blue ocean shift process. Renée Mauborgne is a globally sought-after speaker on innovation, creativity, and growth. Renée will teach you to see opportunities where others see constraints. She'll guide you through a proven process, using inspiring real-world illustrations. You'll learn how to break away from cutthroat competition, create uncontested market space and seize new growth. Renée will also reveal how to build your team's confidence, and move your people beyond worn pathways to create new possibilities. Renée speaks at some of the world’s largest and most prestigious global and corporate events, and has shared the stage with former President Bill Clinton, former President George W. Bush, Bill Gates, former Secretary of State Colin Powell, Rudy Giuliani, former Secretary of State Henry Kissinger, Paul Krugman, film director James Cameron, and Wynton Marsalis, among others. 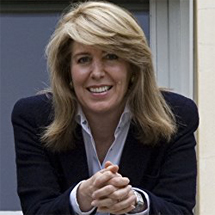 Renée Mauborgne is ranked in the top five management gurus in the world and is the highest-ranked woman on the Thinkers50 list of global thought leaders. She is co-author of the recently released New York Times and #1 Wall Street Journal bestseller, BLUE OCEAN SHIFT and the international bestseller BLUE OCEAN STRATEGY, published in a record-breaking 44 languages and recognized as one of the most iconic and impactful strategy books ever written. She is The INSEAD Distinguished Fellow and a Professor of Strategy at INSEAD, one of the world’s top business schools. She is also Co-Director of the INSEAD Blue Ocean Strategy Institute. She served on President Barack Obama’s Board of Advisors on Historically Black Colleges and Universities and is a Fellow of the World Economic Forum. Mauborgne is the recipient of numerous prestigious awards such as the Nobels Colloquia Prize for Leadership on Business and Economic Thinking, Eldridge Haynes Prize awarded by the Academy of International Business, the Carl S. Sloane Award for Excellence, the Leadership Hall of Fame by Fast Company, and the World’s 50 Best Business School Professors by Fortune.com. L’Expansion named Mauborgne along with her colleague W. Chan Kim as “the number one gurus of the future.” The Sunday Times (London) calls them “two of Europe’s brightest business thinkers,” and the The Observer called them “the next big gurus to hit the business world.” She is the winner of the Asia Brand Leadership Award and Prix DCF (Prix des Dirigeants Commerciaux de France). Mauborgne co-founded the Blue Ocean Global Network (BOGN), a global community of practice on the blue ocean family of concepts that embraces academics, consultants, executives, and government officers. "It was fantastic to have Renée speak at Curious2018, Merck’s 350 year celebration where over 1,000 of the world’s top scientists including Nobel Prize winners gathered together. As the opening keynote speaker, Renée’s talk on Blue Ocean Shift was absolutely great. Brilliant content, brilliant delivery. Awesome and inspiring. I look forward to working with Renée in the future." "Renée Mauborgne recently spoke at our Watermark 2018 Innovation Conference. We were beyond thrilled to secure Renée to speak about Blue Ocean Shift. Her talk with simply top notch, with overwhelmingly positive reviews from our 230+ attendees. She was inspirational, genuine, passionate, and focused on actionable strategy. We look forward to hosting her in the future!"